Set the oven to 350 degrees. Butter the bottom and sides of each ramekin or mold until evenly spread. Pour the cajeta into the buttered molds, distributing evenly between all 12. To Make the Cake Base: In a mixing bowl, beat the butter and sugar with an electric mixer at medium-high speed until fluffy. Then, beat in the egg. In a separate bowl, mix the flour, cocoa, baking powder, baking soda and salt. At medium-low speed, beat in half of the flour mixture and half of the buttermilk into the butter/sugar mixture. Then, beat in the remaining halves. Make sure you scrape the side of the bowl so all of the ingredients mix evenly. Put the mixer on medium-high speed and beat for an additional minute. To Make the Flan: Place the eggs, vanilla, evaporated milk and sweetened condensed milk in a blender and puree until smooth. To Prepare the Entire Dish: Pour the cake batter into each ramekin or mold. Then, pour the flan mixture on top, it will look messy, but don’t worry, that’s how it’s supposed to be! Place the ramekins in a large pan or baking dish. Pour hot water into the dish up to halfway the height of the molds. Cover the dish with aluminum foil and seal. Place the in the oven and bake for about 50 to 55 minutes, or until the surface of each cake feels solid, looks baked and a wooden toothpick comes out moist but not wet. Remove from the oven. Be careful when you open the aluminum foil as the steam will be very hot. Once cool enough to handle, remove the ramekins out of the water bath. Once cool, cover with plastic and refrigerate at least 2 hours before eating. 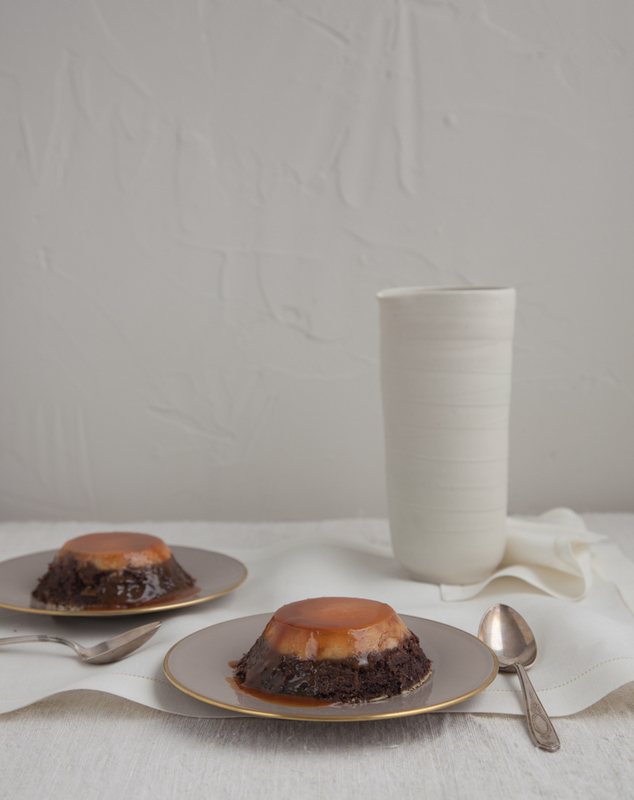 When ready to serve, run the tip of a knife around the ramekin and place it cake-side down onto a plate. Lift the mold up. 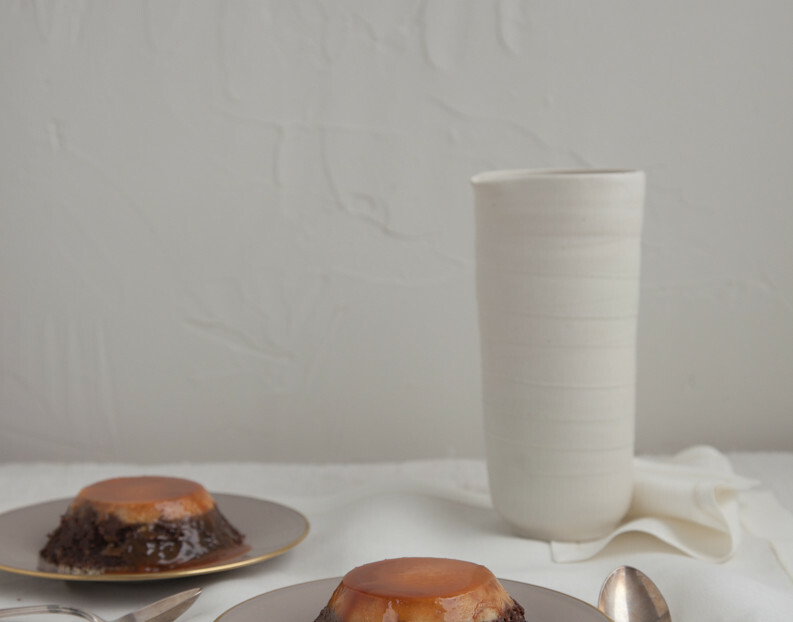 Drizzle with any cajeta from the mold and decorate with chopped pecans. Do you seal the cake or ramekin pans or the whole pan with the water. And how to you seal it? I really want to make the recipe but when I tried a flan recipe from a friend she said to seal it and I thought I did but the flan got bubbles. Thanks so much!! I love your show!! You can do it Pamela! You cover the entire pan with foil…not the individual molds…and seal it as tightly as you can by pressing the foil to the sides. Can you make this in one big cake pan? And if so what size tin and how long would it need to cook for? Absolutely! Just add a little more time, 5 min or so, to baking it until the surface of the cake feels solid, looks baked, and a wooden toothpick comes out moist but not wet. Good luck! I’m planning on making this as a birthday cake and would like to make it in a bundt pan. Does the current recipe work well in a 12 cup capacity bundt pan or do I have to make any adjustments? Has anyone tried this? Yes! Absolutely! You may only need to bake for 5 more minutes.